By Becky Bowers on Thursday, January 24th, 2013 at 12:07 p.m.
Customers line up to buy guns at Adventure Outdoors in Smyrna, Ga. on Jan. 7, 2013. 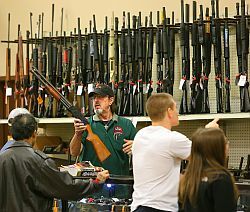 Gun sales were brisk and the store was selling out of ammunition on a daily basis. Is your news feed as full of gun "facts" as ours have been? The president says it’s time to take "meaningful action to reduce gun violence in America." That’s set the stage for gun control advocates and adversaries to deploy the rhetoric, some of it less than useful — or truthful. George Washington said a free people should be armed to guard against government tyranny. (False) Experts told us Washington called for a trained militia to defend the new nation, not a citizens’ stand against their own government. "Semi-automatic weapons, whether pistol or rifle, were designed for use by the military on the battlefield." (False) Nope — try hunting and self-defense. The military did not embrace the weapons until decades after they were developed. Even today, gunmakers design some semi-automatic weapons specifically for consumers. Since 1968, "more Americans have died from gunfire than died in … all the wars of this country's history." (True) We tallied about 1.4 million firearm deaths compared with 1.2 million in war. The number of gunfire deaths includes suicides. In 2011, more people were murdered with knives, "hands or feet" or "clubs and hammers" than with any type of rifle. (True) FBI data backs this claim — though limiting it to "rifles" ignores a significant number of deaths from handguns. "Every day, 34 Americans are murdered with guns." (Mostly True) This stat is close, but the numbers have been declining. The average for 2010, the most recent year for which complete figures are available, was 30. Meanwhile, the latest rolling five-year average was 33. In 2010, 2,694 young people were killed by gunfire. 1,773 were victims of homicide; 67 were elementary school-age children. (Mostly True) It’s important to note that the number of children and youths killed by guns includes suicides and accidents. "Last year, handguns killed 48 people in Japan, 8 in Great Britain, 34 in Switzerland, 52 in Canada, 58 in Israel, 21 in Sweden, 42 in West Germany and 10,728 in the United States." (Half True) The numbers are wildly out of date. They also omit important context, such as population size. But the odds of being murdered by a gun in the United States is far in excess of the risk in the listed countries. "Switzerland (where the government) issues every household a gun . . . has the lowest gun related crime rate of any civilized country in the world!!!" (Pants on Fire) A Swiss researcher told us claims like this are "absurd." The lowest gun-related crime rate? Not for homicide. Meanwhile, the likelihood of a gun being involved in a robbery or an assault in Switzerland is lower in several other countries. In short, this claim appears to be completely fabricated.